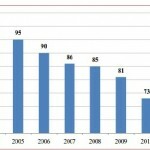 The number of insurance companies in Greece is being gradually reduced. Over the last ten years, 33 companies have shut down or ceased operations. This indicates that the Greek Insurance Market is shrinking, while market executives forecast that it will gradually shrink even more. 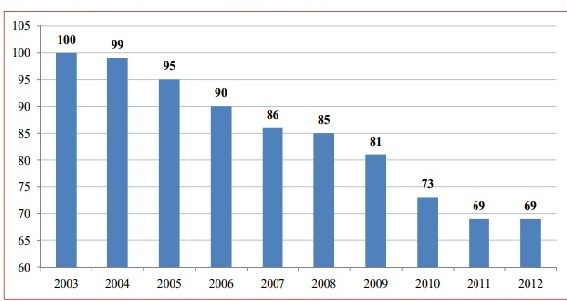 According to the Hellenic Association of Insurance Companies economic data survey for 2012, in 2003 there were 100 insurers operating in Greece, while in 2012 the number shrunk to 69 (see graph). It should be noted that in 2013, two more companies shut dow, EVIMA Insurance and Diethnis Enosis, and so the number of active insurers in Greece has come down to 67. The following table shows the number of insurance companies per sector. Regarding the nationality of the registered branches of insurers operating in Greece: 5 are from Britain, 4 from Cyprus, 2 from France, 2 from Germany, 2 from Netherlands. 1 from Belgium, 1 from Spain, while outside of the EU there are 2 from the U.S. and 1 from the Philippines.